Have you ever inherited an online help or documentation project about which you had no information or description? The result? You wasted resources and time trying to understand the project or, worse… working blindly, hoping that you were working correctly or that you could to go back and fix whatever went wrong. A good project specification can eliminate these headaches. In this book, long-time content consultant Neil Perlin describes how to quickly create specifications. He describes what information to put in a specification, how to write it fast, and how to manage it to keep it from getting overlooked and forgotten. The result? No more wasting time trying to figure out how or why some feature was created or trying to contact the original author. Instead, more efficient and effective project management. The 2017 edition of this STC award-winning book explains how to organize, build, and publish online help, policies and procedures, knowledge bases, user guides and more using the industry benchmark for single source publishing: MadCap Flare. Flare expert Scott DeLoach shares detailed information about how to import content from RoboHelp®, Word, FrameMaker®, HTML, and DITA documents and how to use all of Flare’s features. Each section also includes sample questions to help you prepare for the Flare certification test. “MadCap Flare, l&apos;essentiel pour bien démarrer” s&apos;adresse aux rédacteurs techniques, professionnels ou occasionnels, qui désirent commencer un projet de documentation avec le logiciel MadCap Flare ou améliorer un projet existant. Ce livre est le fruit à la fois de nos formations données sur MadCap Flare, sur la rédaction topic-based et sur la rédaction technique en général, et de notre expérience dans la gestion de nombreux projets chez nos différents clients, chacun avec ses particularités. Ce que ce livre est… Une introduction qui vous permettra d&apos;appréhender les différentes fonctionnalités que vous offre Flare et qui vont vous aider à structurer au mieux votre projet et simplifier votre travail en vous concentrant sur votre valeur ajoutée : rédiger la documentation et la rendre accessible à vos utilisateurs. … et ce qu&apos;il n'est pas Il ne se veut pas une aide exhaustive de Flare. Cette aide existe déjà intégrée au logiciel et en ligne sur le site de MadCap Software. One of the biggest challenges in moving to a new content development environment is migrating existing content to new tools. Moving content, especially unstructured content, can be expensive and time-consuming. 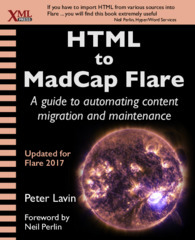 HTML to MadCap Flare shows you how to import content, including dynamic content, into MadCap Flare effectively and efficiently. This book combines clear explanations with detailed examples and complete scripts. It helps writers understand how Flare works and gives tools developers and maintainers what they need to automate the migration and maintenance of content. MadCap Flare for Programmers: A guide to getting the most from Flare shows how MadCap Flare manages and parses content and how you can interact with Flare outside the user interface. It introduces the structure of Flare content files and Flare output files, such as HTML5 help, and shows how you can manipulate those files. Focuses on Cascading Style Sheets which is core to getting the most out of Flare publishing. This easy-to-use and comprehensive book provides answers to over 140 HTML5 questions. MadCap Flare is one of the leading help authoring tools on the market. Its features range from straightforward ones used to create topics, to an almost overwhelmingly powerful stylesheet editor, to features like support for responsive design, HTML5, and the DOCTYPE that have strategic implications and may be unfamiliar to many help authors. As useful as these features are, they can also be confusing, especially for authors who are self-taught and find themselves swamped with unfamiliar or advanced options. This book addresses forty-one of these often unfamiliar or advanced options. This book addresses forty-one of these often unfamiliar or advanced options. The book is based on questions that accumulated during nine years of consulting and training as a MadCap-certified Flare trainer and consultant (and almost twenty more working with help and web authoring tools and coding before Flare). Each discussion stands alone, so you can just scan the book to see what looks useful. Neil Perlin, president of Hyper/Word Services, is an internationally recognized consultant in online and mobile information design and development. He provides training, consulting, and development services for companies ranging from Fortune 100 to startups, and is a certified consultant and instructor for MadCap Flare, MadCap Mimic, and Viziapps. He is the author of Essentials of MadCap Mimic 6, two earlier versions of this book for Flare 8 and 9, and Creating Mobile Apps Without Coding. You can reach him at nperlin@nperlin.cnc.net, www.hyperword.com. Advanced and Unfamiliar Features in MadCap Flare 9: What Does That Do? Updated for MadCap Flare v9. Flare is one of the leading help authoring tools on the market. Many of its features are straightforward but some, like its CSS editor, have complex and often unfamiliar elements. Other features, like the DOCTYPE specification and HTML5 support, have strategic implications. These features can be confusing, especially for authors who are self-taught and find themselves swamped with unfamiliar options. This book addresses 38 of these options in Flare 9, many of which apply back to Flare 8 as well. Note: This book was authored using MadCap Flare. Flare is one of the most powerful help authoring tools on the market today. Its features range from the straightforward mechanical ones to complex design and programmatic features like its stylesheet editor, to strategic features like support for HTML5 and DOCTYPE specifications. This book is based on seven years of consulting and training as a MadCap-certified Flare trainer and consultant, and another twenty working with online help systems. This book shows you how to write simple user assistance rather than complex user annoyance. This book tells you how to structure, index, and link your documents so that readers actually find the information that your documents contain. Setting up templates and style sheets that are efficient to use when creating and updating a document requires a lot of experience in technical writing. The rules presented in this book are the essence of this experience. This book provides hands-on advice and simple, catchy examples—free from theoretical elaborations and highbrow grammar terms. Ideal for developers, marketing professionals, or product managers who need to create some user assistance for their products but don't have the time to study a dozen all-embracing textbooks about technical writing before getting down to work. A great overview for working with MadCap Flare including many tips and best practices. A good overview of the technologies that are the foundation beneath Flare. It also features a great Visual QuickStart series. Useful to polish up your general authoring skills. The more that you work with Flare the more you will come to realize that Cascading Style Sheets, or CSS, have huge amounts of power and control in just how your content is formatted and presented. Learning as much as you can about CSS will pay dividends. This a great CSS book from the actual creators of the CSS specification. If you want to go beyond the built in capabilities and want to explore some of the advanced possibilities available with some custom hand scripting, this is a good place to start. A great book by technical communication expert Neil Perlin on utilizing MadCap Mimic. While digital technologies have revolutionized the publishing world in the twenty-first century, one thing still remains true: The Chicago Manual of Style is the authoritative, trusted source that writers, editors, and publishers turn to for guidance on style and process. Maximize the impact and precision of your message! Now in its fourth edition, the Microsoft Manual of Style provides essential guidance to content creators, journalists, technical writers, editors, and everyone else who writes about computer technology. Plain English is the art of writing clearly, concisely, and in a way that precisely communicates your message to your intended audience. This book offers 25 practical guidelines to help improve your vocabulary, style, grammar, and layout in order to achieve clear writing. Direct from IBM’s own content design experts, this guide shows you how to design product interfaces and technical information that always place users front and center. This edition has been fully revised to help you consistently deliver the right content at the right time.